The Southwest Visa 50,000 Rapid Rewards points offer has been available for over a month and is due to end on October 30, 2014 according to the terms on the application. If you were thinking about applying for this offer or wanted to get the Companion Pass for next year by applying for two cards, now is the ideal time. If you apply now and hit the minimum spend in January, the 100,000 from the two bonuses will be deposited into your account in early 2014. 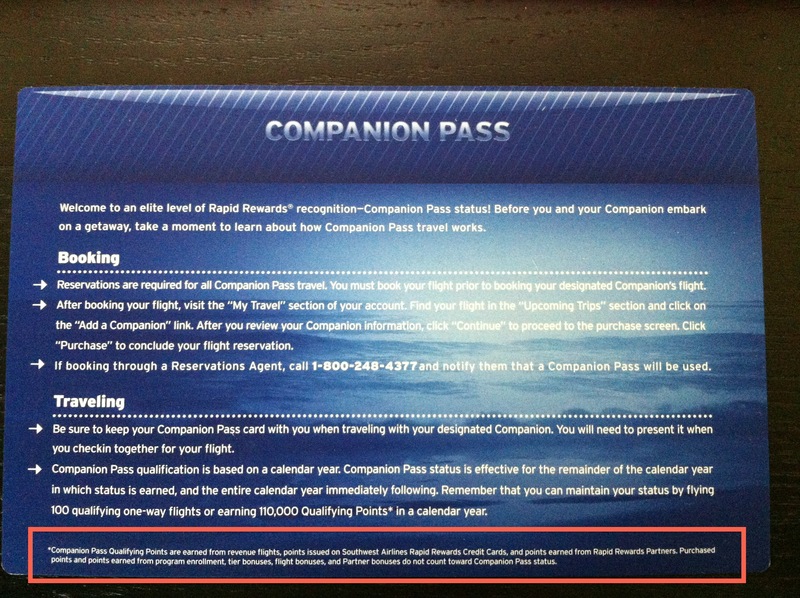 This is essential for maximizing the Companion Pass for two full years. What is the value of 50,000 Rapid Rewards points? The card offer is marketed as a bonus worth 2 round trip flights on Southwest or Airtran flights. A better way to look at it, you will get around $845 worth of free flights when you redeem them for Wanna Get Away fares. At that level 60 points = $1, but you can stretch the value of the points to close to 2.0 on some Wanna Get Away redemptions. For the last year, I have been redeeming points for flights from Portland, OR to Los Angeles for around 8,000-10,000 points at the Wanna Get Away fares so if you are interested in shorter domestic flights this offer could be worth up to six round trip flights. Keep in the back of you mind that on March 31, 2014 Southwest is devaluing the points to equal 70 points = $1, so you might want to try to use some points before then. How can you earn the Companion Pass? The 50,000 points bonus from the credit cards have been counting towards the 110,000 points needed to earn the Companion Pass. The easiest way to earn the pass is to sign-up for two of the credit cards to earn 100k points (104k with the minimum spend requirement). You will just be 6,000 points shy of the total needed to earn the pass. Chase will allow you to earn the sign-up bonus once for all 4 version of the card and it is also possible to be approved for two cards in one day. What is a Companion Pass worth? The pass could be worth $1,000+ depending on how frequently you use it. It will allow any designated companion to fly for FREE (just pay $10 in fees) on any Southwest flights you are on. This is good for any flights you book with points or purchase and it is unlimited. If you just use your pass to redeem the 110,000 points you will double the value of your points and get at least $845 from the pass. How long is the Companion Pass valid for? Once you hit the minimum spend requirement for each card you are approved for within three months and then reach the 110k points required for the Companion Pass, you have the rest of that calendar year plus the entire following year to use it. That’s why now is a great time to apply for the card because if you meet the requirements by January you will have two whole years to take advantage of the Companion Pass. Which Southwest credit cards are offering 50,000? All 4 versions of the card currently have the 50,000 sign-up bonus until October 30, 2014. In the past the offer has been released for only the Plus cards or the Premium cards, or a mix of the two. To apply for the Southwest credit cards click here. * If you found this post useful, why don’t sign-up to receive free blog posts via email (max of 1 email per day!) or like us on Facebook…and never miss an update! Applied Sunday, both approved! The Biz car went through in a day when I called to inquire, it was pending on submit. The personal, pending as well, I had to close an existing account. 4 open cards was their personal limit for me, shifting available credit from one card didn’t seem to be an option. In the end I closed an account and shifted the credit line over and it was an account that was only open 4 months so it won’t kill me to lose it for length of history really. Time to “time” that spend to hit in Jan! Thanks for adding the great info points! I agree that Chase seems to limit 4 open personal cards. Currently I have 4 cards and am going to launch another round of credit card applications soon. I’ll let you know how it goes. I currently have 5 chase cards including 4 that I opened this year. I don’t think there is a max number of cards, just a max amount of credit they will assign to you.